We’re a full year ahead of schedule. You don’t hear that very often, but our business model for this magazine, launched just over three years ago, was to secure readership in North America the first four years and then broaden internationally by introducing ourselves to the world at the 2018 INTERGEO. This annual conference held in Germany is the world’s leading trade fair for surveying, geodesy, geoinformation, and land management. With our North American readership up significantly these past three years and a clear yearning for more geospatial content globally, we felt the time was right to move forward a year early. There’s been a lot going on behind the scenes that our subscribers don’t see. For example, several publications as far away as Australia regularly request permission to reprint our articles, and many articles (for example, our July 2017 cover story on a visit to Trimble’s R&D facility in Sweden, “Inside the Big Eye,”) are translated in several languages for distribution in nations other than the U.S..
xyHt’s print and online circulation is growing in North America, yet even more rapid is online growth worldwide; a surprising number of visitors to our website are international. In addition to our North American numbers, we have significant upticks in site visits and online subscriptions from the UK, France, Mexico and Latin America, Denmark, Russia, Australia, Canada, China, and Spain. So, the time was right. Our publication has evolved, as have surveying and geomatics. For our long-time subscribers (we spent our first 33 years as Professional Surveyor Magazine), it should be comforting to learn that people in far reaches of the globe have similar goals as you do, are using some of the same tools, and are encountering some of the same problems. The world is continuing to shrink in terms of everyone’s global contact, and xyHt is helping make needed connections among geospatial practitioners everywhere. Rest assured, the core of our publications is still geospatial work, and we focus on providing practitioners in the U.S. with global, regional, and national guidance examining, for example in this issue, cadastral systems on both side of the Atlantic. Our publication has evolved, as has surveying and geomatics. 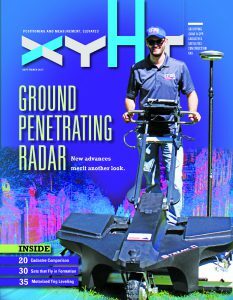 In this issue, we also present features on the latest evolutionary steps in ground penetrating radar and motorized trigonometric leveling. Describing technological advancements and new processes from other countries to those of you in the U.S. introduces you to what could be applied here, or at the very least learned from. Too often, we in the U.S. work and think in the vacuum of our own country, but those blinders are no longer helping us progress, and in some ways we’re falling behind (read Topcon president Ray O’Connor’s insights later this month). But why launch internationally at INTERGEO? Those of you who have been there understand. Those of you who haven’t, make it a point to go at least once in your working career. It will open your eyes to things you hadn’t thought of. It’s an exciting place to be if you work in this field. And, if that’s not convincing enough, go for the beer. It’s truly the world’s finest! To read the rest of the articles in this print issue, click on the issue cover, below. Neil Sandler is the publisher of Flatdog Media.